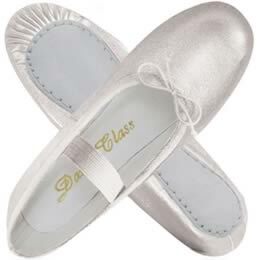 Beautiful ALL LEATHER silver ballet shoes. Pleated toe, elastic ankle strap attached and elastic draw cord to snug the fit. Whole and half sizes, Medium width. Manufacturer recommends ordering ONE FULL SIZE larger than your USA street shoe size.